Amyotrophic Lateral Sclerosis or ALS is a neurological disease that involves the nerve cells or neurons that control the movement of voluntary muscles. Voluntary movement includes walking, talking, chewing. Till date there is no known cure for ALS and the disease only gets worse over a period of time. There is no treatment to halt or reverse this disease. There are around 6,000 people in the US who are diagnosed with Amyotrophic Lateral Sclerosis every year. Amyotrophic Lateral Sclerosis affects the motor neurons which causes deterioration and death of the motor neurons. The nerve cells that connect the brain to the spinal cord and to the muscles in the body are the motor neurons. The motor neurons are responsible for the communication between the brain and the voluntary muscles. In Amyotrophic Lateral Sclerosis, as the motor neurons degenerate, they stop sending signals to the muscles. The brain is not able to send messages to the voluntary muscles. The early signs of Amyotrophic Lateral Sclerosis include muscle weakness. The patient slowly starts losing their strength and even speaking, eating, moving and breathing gets affected. Within 3 to 5 years of the first signs of ALS, the patient is likely to suffer from respiratory failure. The engineers from MIT have designed a microfluidic chip. They produced the first 3-D human tissue model of the interface between motor neurons and motor fibers. In order to generate neurons in the model, the researchers used the cells from healthy people or those affected by Amyotrophic Lateral Sclerosis. This would allow the researchers to test if the drugs are effective. Roger Kamm, the Cecil and Ida Green Distinguished Professor of Mechanical and Botanical Engineering at MIT and the senior author of this study says that they have found a great difference between the healthy cells and the Amyotrophic Lateral Sclerosis cells. They were able to show the effects of the two drugs and they are in clinical trials. 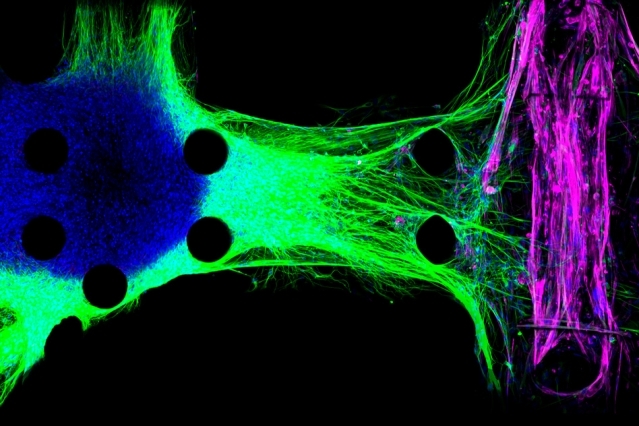 The 2-D structures of tissue models of the connection between motor neurons and muscle cells were developed by the scientists sometime back. These 2-D models are not the exact replica of the complex physiology of the tissue. The 3-D neuromuscular junction model was developed by Kamm and his colleagues two years ago. In the 3-D model, the adjacent compartments in the microfluidic chip were occupied by neurons and muscle fibers. The neurons give out long fibers known as neurites that attach to the muscles, thereby allowing the neurons to control their movement. With the help of optogenetics, the neurons are engineered whereby their activity is controlled with light.When the neurons are activated by light, the researchers are able to measure how much the muscle fibers contract based on the displacement of the pillars around which they are wrapped. The researchers induced pluripotent stem cells from humans to generate muscle cells and neurons. The system worked and then they incorporated neurons from the induced pluripotent stem cells from a patient with sporadic Amyotrophic Lateral Sclerosis. There was a marked difference noticed between the ALS model and the neuromuscular junctions from healthy cells. In the ALS model, the neurites grew at a much slower pace and they did not form strongconnections with the muscle fibers. This study showed that the Amyotrophic Lateral Sclerosis neurons do not form a firm connection which leads to weaker muscle control. The ALS motor neurons also attacked the healthy skeletal muscle tissue. By using neuron cells from Amyotrophic Lateral Sclerosis patients along with stem cell derived muscle cells and the formation of a functional neuromuscular junction was a great breakthrough in the field of tissue models on a chip. With the help of this model, the researchers tested two drugs-rapamycin and bosutinib which are under clinical trials. They discovered that when both the drugs were given together, the muscle strengththat had been lost in the ALS motor units was restored. The rate of cell death in the ALS motor units also reduced. This tissue model could be useful for studying other muscular diseases like muscular atrophy which affects the nerves that are found in the spine.